When summer time rolls around on the Chesapeake Bay, watermen, tourists and locals alike start thinking about one thing: Blue Crabs. Will there be enough? How much will they cost? How long will the season last? Past years have seen seasons cut short based on regulations that conservatively lower scientifically determined catch limits as a precautionary management measure, because real-time harvest data is limited. The process for counting how many crabs have been caught – and by whom – has been problematic, relying on a paper-based system that is time-consuming and too slow to allow meaningful adjustments to catch limits midseason. This year, both watermen and state officials agreed that a new system, using modern and faster technologies, was needed. The Maryland Blue Crab Accountability Pilot Program – a unique and collaborative effort being led by Maryland’s commercial blue crab industry – officially launches July 16th. Recognizing that sustainable fisheries management requires sound science and accurate harvest and effort information, commercial watermen have teamed up with Environmental Defense Fund (EDF) and the Maryland Department of Natural Resources (DNR) to improve the accuracy and timeliness of harvest reports. A major first step toward reforming management of the fishery, the pilot will evaluate a new reporting system that relies upon real-time harvest reporting – using cell phones, smartphones and tablets – to submit catch data and other harvest information electronically from the water each day. The system was designed by the Maryland Blue Crab Design Team, a diverse group of 32 watermen and representatives from the seafood industry, DNR and EDF. The team spent months working together to determine how to better achieve a healthy, profitable and collaborative blue crab management system for Maryland’s iconic blue crab fishery. With watermen playing a leadership role, the team determined that no management program would work without first vastly improving the data upon which all management decisions are based. Throughout this process, Maryland’s commercial crabbing industry has led a dynamic and responsible approach to management reform. State fishery managers have shown laudable support for the industry’s initiative, and EDF has brought new ideas, guidance and expertise to the table. As a result, over 75 Maryland crabbers, aged 24 to 88, have volunteered to participate in the pilot project. Their motivation? To improve accountability in the commercial sector that will lead to a sustained, healthy crab population, a more efficient management system, and a profitable crabbing industry. A Baltimore Sun news report, by Sun reporter Tim Wheeler, that ran yesterday, discusses this innovative project and the benefits of watermen engaging in the management and data collection process. Virginia watermen seem to be watching carefully to see what happens and whether such a program might help on their side of the Bay, National Public Radio reports on this story here. 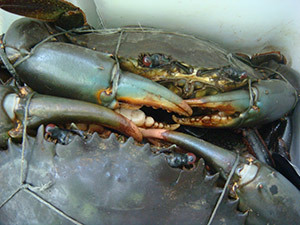 This entry was posted in Domestic, Mid-Atlantic and tagged blue crab, Data Collection, Maryland. Bookmark the permalink. Both comments and trackbacks are currently closed.